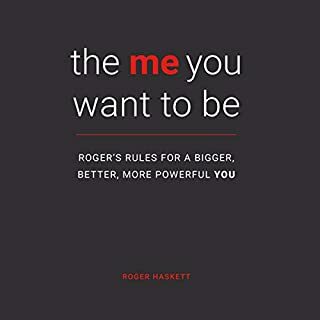 In this inspiring book, celebrated keynote speaker, entrepreneur, actor, teacher, director, and writer, Roger Haskett, helps you discover incredible new ways to create internal power and become The Me You Want to Be. Filled with fascinating stories, interesting studies, and practical information, you will be moved to make a significant change in your life. There are plenty of Roger's Rules that I found applied to my life. But the key rule, at least so far, has been Fight to Be Positive. With the stories, examples and neuroscience that Roger illustrates his rules with, it is easy to follow along and develop a plan to implement his rules right into my life. The audible file is a great way to listen to this book. Not only is it written for almost everyone, but with Roger himself doing the narration, you can really get a feel for his enthusiasm and expert speaker/teaching skills. I think this is a very powerful and insightful book. I am going to give a copy to each of my adult children as gifts, as I think that they will benefit greatly from it.